Master essential creative tools easily with this collection of courses. If you want to be a graphic designer, you'll have to master certain essential creative tools first. 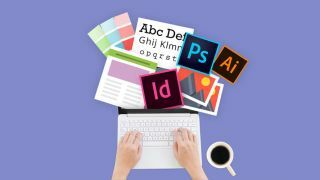 Luckily, you can learn how to use a whole bunch of them with one streamlined course – The Ultimate Graphic Design Bundle: Lifetime Access. You'll learn how to create awesome concept art by drawing with Photoshop (get Adobe Creative Cloud here). You'll discover aspects of real-world graphic design using Illustrator, even creating your very own flat design spaceships, practise typography, logo design, and a whole lot more to gain some hands-on experience before you launch your career. Try it out for just $29 – down 98% from the regular price of $1592.